I can only describe that engine as beautiful, does the screen cooling work as well and how much time did you take timing the ignition trips, I've watched owners of full size engines spend ages trying to get full size ones working properly, Vanderoot verticals are few and far between in the uk but there are a lot of open crank horizontals about. Finally was it a set of castings or made from scratch. Oh I really do like that and some lovely engineering, did you cut all those corner joints on the wooden box by hand. You know me Jason, what type of engine is it, how does it work and Martin mentions screen cooling..? Screen cooling was a method favoured by the Americans to cool the engine water, the pump that the engine is driving pumps the water through the engine and it comes out of the pipe at the top of the cone in a spray pattern down the screen, because of the surface area and the surrounding air it cools the water which collects in the tank at the bottom to go around again, engilsh manufacturers tended to rely on large tanks of water which evaporated off the heat. As its Jasons engine I will let him describe how it works. Martin, I have spent a lot of time fiddling with the ignitor trip, it does not have the same adjustment methods as some or the horizontals that I have built so is a right pig to get working anywhere near right. The pump does work when I have tried it with a cordless drill, may hook it up and run some water through it once the engine is running well though they don't get too hot and can be run for several minutes dry. Ron, this is how I did the joints. The engine would be classed as a Vertical Hit & Miss Engine. vertical as it stands upright rather than the more common layout with a horizontal cylinder. The hit and miss bit refers to how the speed is controlled (not set working in that video) There is a pivoting weight on the inside of the flywheel that swings out as the engines speed increases, as it rotates round it pushes a lever that will latch the exhaust pushrod in the open position which means there will be no compression and the engine won't fire which is the miss part. As the speed drops the latch will release and close off the exhaust so the engine will then be able to draw in air/fuel as there will be a vacuum when the piston goes down - compressed - fire which is the hit part. When the engine is running under load it may not get up to a fast enough speed to miss so will fire on each stroke, if the load is taken off then it will start to miss. If you watch my video of it's stable mate you can see that the exhaust rocker arm only lifts clear of the valve about every 3rd or 4th cycle. And before it was painted you can see me manually making it miss by holding the rocker down about half way through. The vertical should be running more like this. Otherwise it is just a 4-stroke engine, the only slight difference is that the inlet valve does not have a mechanical opening such as push rod and rocker. It just has a weak spring which is just enough to hole the vale closed but on the intake stroke the vacuum in the cylinder will open the valve letting the air/fuel mix in. 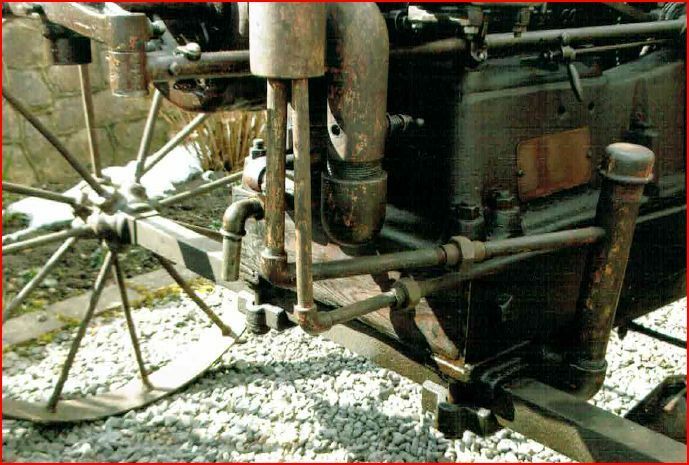 As the carb is at the top of the engine this one also has a fuel pump down on the left hand side - the whole bottom casting is the fuel tank - which constantly pumps fuel to the carb with any excess flowing back down to the tank under gravity. It does not use a spark plug but has what is known as an ignitor. Basically a set of moving contacts that are within the head. As the exhaust pushrod moves up it has a lever on the side which closes the contacts and allows electricity from the battery to flow around a circuit containing a low tension coil. As the rod goes up more it moves away from the ignitor and allows the contacts to open but the energy in the coil causes a spark to jump across the gap and this is what ignites the fuel. They are very tricky to make with lots of small parts and torsion springs to be wound. As said by Martin cooling is buy water being pumped into the bottom of a water space around the cylinder then into voids in the head before overflowing down the wire mesh which cools the water before it gets pumped round again. That is fascinating and different too, I am really impressed with it I could sit and watch it run for ages. I can see what you mean about tricky to make with all those small parts and I can imagine it taking some time and effort to set up. I see from the link that it runs on gas, is that always the case or can they run on other fuel, I was assuming yours was running on petrol. I have learnt something in using a slot drill to cut wood, again I would have assumed that wood cutting bits have to be used, thats good to know. Which wood did you make the box from Jason, is it oak.? You said that you made the trolley from scratch, did you look at pictures as its a very good approximation of an Amanco engine trolley particularly the wheels, Amanco wheels were fabricated. Ron, In America it is a gas engine as that is what they call petrol. It is designed to run on petrol or as a lot of us do it can be run on what the Americans call "white gas" which is a liquid fuel commonly used for camping stoves etc and goes by the name of "Colmans Fuel". The main advantage is it does not smell like petrol so if you keep your models indoors they don't stink the house down, the exhaust fumes are not as bad either. You can also use some of the "Green" fuels for lawnmowers etc such as Aspen. Martin, if you look back at earlier posts in the thread I linked to about making the box I have gone into a bit more detail about the carts and their construction. They are probably both a bit big for these small engines but I was asked to see if I could do them to match some photos, this is what the vertical one is based on. I did similar with my 1/3rd scale galloway basing the cart on some photos from a US e-bay advart that had a few sizes that made scaling it easier. I do have a set of castings for an Associated Hired Man but that will be a very small barrow type cart. Jason, I was forgetting I was looking at an American site and when I read gas or propane I didnt make the connection between gas and petrol. I have just finished reading through your link to "the cart" and I have to take my hat off to you, that for me was something of a master class in model engineering. The thought, the approach, the design let alone the skill and craftmanship that went into it I thought was inspiring. Someone commented "you make it all look so easy" and I think that speaks volumes Jason. I've spent a couple of days this week sorting out my powersaw, a new motor, new drive belt and a complete rewire which gave me a nasty surprise. I took the switch apart to find no form of cable clamp for either the power in or the power out to the motor, the power in earth was connected to the center of three contacts but the power out was connected to the switch frame so no connected earth, these were soon put right. I then cut a piece of 22mm steel measured its thickness and tinkered with the saw blade supports and manage to get another piece cut with only an error of 0.1mm difference in thickness, I think I will leave it at that, not bad for an old machine that I was given at least six years ago in a sorry state. Jason, that is really superb work with excellent detail. Very well done indeed! Really good to watch the talents abound in these groups. I have finally succumbed and am going to cease making tools and machines for a while and try a long time fascination - a Stirling engine. There is just such a massive onslaught of info on Stirling engines on the web that after many many hours of googling, I have no idea where to start! Managed to get some more done to the universal head upgrade. Added locating bar to the base plate so that it slots snugly in the t slot on the table. Upper part nearly done apart from engraving the degrees scale. The 40mm indexable head I have didn't leave a great finish so I will give it a rub down when everything else is complete. All parts fitted together to see how it looks on the tool grinder and so far so good. I'm up at Alley Pally so will post a link later. Or if you view one of the above videos on YouTube you can look at my channel, Galloway is towards the bottom. Also worth looking at the Monitor and Gade which show the governors latching as the should. Oops sorry Jason, didnt realise you are at the exhibition. Watched the Galloway video, very nice and I was surprised how quick it runs it gets quite a lick on. Also watched the Monitor and Gade and see what you mean about the governors you can see them operating quite clearly. Jason, out of interest a couple of questions from the cart build and the wheels. When you cut the centres from the steel discs was the tool a parting tool, cant quite see the tip in the photo. Also when turning the radius on the hubs, is the ball cutter you used your own design and build. It's what is commonly known as a trepanning tool, much like a parting tool but one edge needs extra clearance so it won't rub on the outside edge of the groove being cut. I made the ball turner but it is more or less to the Steve Bedair design, if you google "bedair ball turner" you should find drawings. Bought for a pittance from a market stall years ago, it's ground square on the inside edges as well as the outside and ends. Work of a few moments to clamp to the mill table. That's the bob sitting on the swarf tray btw. Couple of G clamps to pull the cylindrical surface against the faces of the angle plate and "Bob's your uncle" you might say. 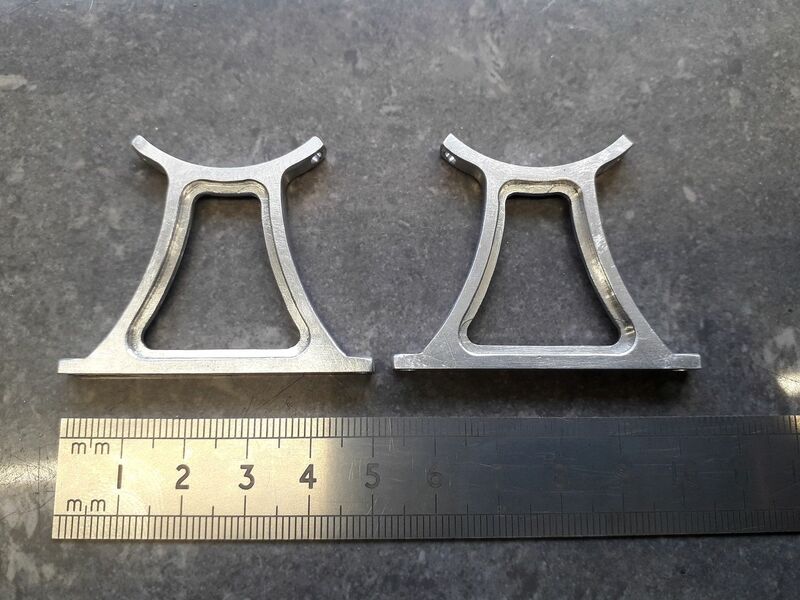 Spent yesterdays workshop time winding rotary table handles to turn a couple of bits of 5mm thick aluminium into sawrf, I did find these two parts left in the pile and think they may do as cylinder supports for my Forest styled flame licker. Nice Jason, they must have taken quite a lot of re positioning as there is a number of radii in them, no five minute job I would have thought.